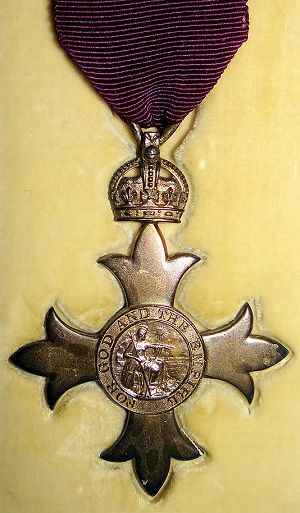 “The KING has been graciously pleased to give orders for the following promotions in, and appointments to, the Most Excellent Order of the British Empire for services in connection with the War, to be dated 1st January, 1920:— […] To be Members of the Civil Division of the said Most Excellent Order:— […] Miss Ethel Mary Atcherley. Queen’s Hospital, Birmingham.” — London Gazette, 30 March 1920. Ethel Mary Atcherley [ ], born on 12 February 1884 at Moortown in the parish of Ercall Magna, Shropshire, was the second daughter of William Henry Atcherley and his wife Charlotte Emma (née Shakeshaft). There had been Atcherleys at Moortown since the mid-1700s (see The mothers of the Moortown Atcherleys), but the family’s residence there came to an end when Ethel was still a child. The 1891 census enumerated Ethel, with her parents and siblings, at Waters Upton. If her family had not left the farm – and its farming way of life – at Moortown, Ethel would probably have remained with her parents until, perhaps, she was married to a young man from one of the other local farming families. But circumstances were now very different, and the 1901 census recorded 17-year-old Ethel as a ‘help’, living with farmer John Matthews (and his wife, children and servants) at Hints in Staffordshire. Eventually Ethel was reunited with her parents and siblings. She is shown with them, on the 1911 census, at Moseley (on the outskirts of Birmingham, but then still part of Worcestershire). By this time, Ethel was working in a very different field: according to the census she was a “School Teacher (Private)”. I do not know when Ethel’s career as a teacher began, but I do know that it did not continue for very much longer after 1911. In 1916, “Miss E. M. Atcherley, cert. Queen’s Hospital, Birmingham” was elected as a new member, number 3915, of the Society for State Registration of Nurses. 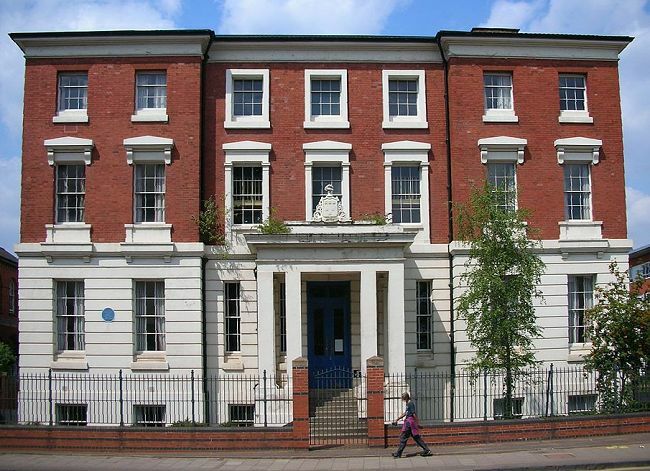 The Queen’s Hospital, on Bath Row in Birmingham (the original building, pictured as it is today, can be seen above), opened in 1841 as a teaching hospital of the University of Birmingham Medical School. The hospital expanded its capacity over the ensuing years, from an initial total of 70 beds to 178 in 1908 (when a new block was opened). Its facilities were called upon for the treatment of wounded servicemen following Britain’s engagement in the war in Europe in 1914. Perhaps it was the war which had prompted Ethel to train at Queen’s Hospital and enter the nursing profession, so that she could ‘do her bit’ just as her brothers did (see Brothers in Arms: Four Atcherley siblings in World War One – Part 1). The main facility in Birmingham for treating the wounded during the Great War was the 1st Southern General Hospital. Plans for the creation of this hospital, from buildings belonging to the University of Birmingham, were made in 1909 and put into effect in August 1914. The first casualties arrived on 1 September that year, and as the war progressed the hospital expanded into additional buildings and increased the number of beds available. By mid-1916, the 1st Southern General Hospital had 1,560 beds. Other Birmingham hospitals also made a contribution, including, of course, Queen’s. In July 1915 the Birmingham Daily Gazette reported that many war casualties had been given attention at the Queen’s Hospital, including about 50 Belgian soldiers. At that time one ward, of 26 beds, contained wounded. For Christmas that year, the soldiers’ ward “received special treatment in the decorative scheme, and everything was done to give the men an enjoyable time.” Gifts, pipes, tobacco and cigarettes were distributed and carols were sung. “Dinner was a jolly meal, and in the evening the soldiers’ ward was the scene of a merry dramatic entertainment”. I think it is very likely that Ethel Atcherley was among the staff who ensured the wounded soldiers at Queen’s had the happiest Christmas possible. The treatment we Australians and others have received whilst we have been here (six weeks) is everything that we could desire. The staff, from the highest downwards, have always treated us with every kindness and consideration, which we will never forget or be able to thank them enough for. It will always be a pleasant memory. The Queen’s Hospital, Birmingham, has, at the request of the military authorities, given over the whole of the new block for the treatment of wounded soldiers (100 to 150), and the secretary will be pleased to receive contributions towards the “Soldier’s Fund.” Gifts of eggs, vegetables, fruit, etc., will be gladly received by the matron. With an entire block dedicated to casualties of war, Queen’s Hospital was able to admit 715 “sick and wounded soldiers” in 1917, and over the course of the war 1,600 casualties were treated. This was a small part of the total of around 130,000 soldiers treated in Birmingham hospitals up to the Spring of 1919 – but those who were looked after at Queen’s, by Ethel Atcherley and her colleagues, were I am sure very grateful. In all the hospitals in Birmingham the news was received by the wounded with hearty cheering. At the Queen’s Hospital, the message was immediately carried to the lower ward. For a fraction of a minute there was a dead silence, and then the ward resounded with the cheers of the wounded men. Service was held in the chapel at noon, and was attended by all the patients who could get there, together with the doctors, nurses, and hospital staff. An address was given by the Rev. G. H. Moore, chaplain of the hospital. The Society for State Registration of Nurses which, as we have seen, Ethel joined in 1916, was established on 1902. As its name suggests, the society campaigned for the registration of nurses, specifically those who were appropriately skilled and qualified. Having obtained a nursing certificate at Queen’s Hospital, Ethel Atcherley was a supporter of this campaign, which sought to protect the status of qualified nurses and also protect the public from incompetent (and indeed immoral) members of the profession. Before the First World War, a number of Bills put before Parliament with the aim of making the state registration of nurses a reality, had all failed. The campaign continued during the war however, and in the year following the conflict’s end it finally met with success. The Government itself introduced a Bill which was passed and became law – as the Nurses Act – on 23 December 1919. After the presentation of the medals, the Mayor of Warwick congratulated the recipients on their well-deserved honours. These were awarded for services given, and work well done. The Mayor also expressed the pleasure that he felt at the presence of the Lord-Lieutenant at the investiture. The Earl of Craven: It is part of my duty, but it does not take away any of the pleasure it gives me to be able to give these medals. Ethel Mary Atcherley, MBE, continued her nursing career after World War One. She appeared on electoral registers as a resident of Queen’s Hospital, Bath Row, Birmingham from 1920 until 1927 (and possibly later). She became a Chartered Masseuse and was listed by on the Register Of Bio-Physical Assistants from 1930 to 1933. The Register of 1930 gave Ethel’s address as Birmingham, but from 1931 Ethel was listed at the Royal Mineral Water Hospital, Bath. By 1939, when the National Identity Register was compiled at the beginning of World War Two, Ethel Atcherley had moved again, to Long Eaton in Derbyshire. A State Registered Nurse, Chartered Masseuse, Ethel’s address was 20 Derby Road. Kelly’s Directory of Derbyshire for 1941 shows that Miss E M Atcherley was matron of the Long Eaton Sick Nursing Association & Clinic at this address. Ethel did not forget the city of Bath during its time of need however, and sent a donation to the Mayor of Bath’s Air Raid Relief Fund in 1942. At the end of the Second World War, or possibly before, Ethel returned ‘home’ to Birmingham to live with – and perhaps care for – her mother. A 1945 electoral register for the city shows that Ethel M and Charlotte E Atcherley were then residing at 130 Wood End Road, Erdington. Charlotte died the following year, aged 93. Ethel, who unlike her sisters (see Ada, Charlotte and Hilda Atcherley) had not married, remained in Birmingham following her mother’s death. She was of 5 Kingston Court, Lichfield Road, Sutton Coldfield when she herself passed away, at the age of 87, on 12 February 1971. Picture credits. The former Birmingham Accident Hospital (originally the Queen’s Hospital): Photo by Oosoom, taken from Wikimedia Commons and adapted, used and made available for re-use under a Creative Commons licence. Nurses with Quarter-Master-Sergeant Williams: Picture from The British Journal of Nursing, 3 Oct 1914, page 267, taken from copy at Internet Archive which gives copyright status as Not In Copyright. MBE: Photo by Bjørn Christian Tørrissen, taken from Wikimedia Commons and adapted, used and made available for re-use under a Creative Commons licence. London Gazette, issue 31840, 30 Mar 1920, 3rd supplement, pages 3757 to 3813. Birth of Ethel Mary Atchesley registered at Wellington, Shropshire, March quarter 1884; volume 6a, page 750. 1891 census of England and Wales. Piece 2130, folio 59, page 7. 1901 census of England and Wales. Piece 2653, folio 134, page 9. 1911 census of England and Wales. Piece 18692, Schedule 256. The British Journal of Nursing, volume 56 (25 Mar 1916), page 275. Copy viewed at the Royal College of Nursing archive (historical nursing journals). Birmingham Accident Hospital. At: Wikipedia (website, accessed 12 Mar 2016). The 1st Southern General Hospital. At: The Long, Long Trail (website, accessed 12 Mar 2016). Queen’s Hospital. At: Birmingham B14 website (accessed 12 Mar 2016). Birmingham Daily Gazette, 31 Jul 1915, page 8. Caring for the Wounded. Birmingham Mail, 27 Dec 1915, page 4. Queen’s Hospital. Archie Barwick. At: National ANZAC Centre (website, accessed 12 Mar 2016). Birmingham Daily Post, 4 Sep 1916, page 8. 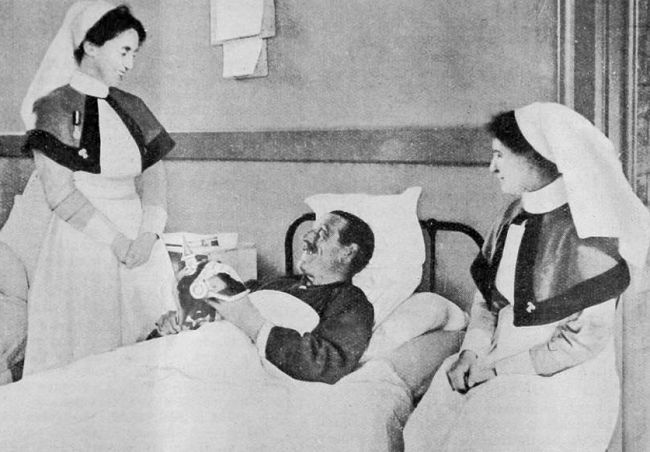 ANZACS in Birmingham Hospitals. Birmingham Daily Gazette, 23 Oct 1916, page 5. Queen’s Hospital. Birmingham Mail, 7 Mar 1918, page 5. Queen’s Hospital. Birmingham Daily Post, 12 Nov 1918, page 9. In the Hospitals. Graham R. Williamson, Tim Jenkinson, Tracey Proctor-Childs (2010), Contexts of Contemporary Nursing. 2nd edition. Page 44. Copy previewed at Google Books. Registration of Nurses. At: The Royal British Nurses’ Association website (accessed 12 Mar 2016). Leamington Spa Courier, 1 Apr 1921, page 3. Investiture at Warwick. Register of Electors, Spring Register 1920, Parliamentary Borough of Birmingham, Edgbaston Division. Market Hall Ward, page 3. Copy viewed at Ancestry – Midlands, England, Electoral Registers, 1832-1955. Register of Electors, Spring Register 1925, Parliamentary Borough of Birmingham, Edgbaston Division. Market Hall Ward, page 2. Copy viewed at Ancestry – Midlands, England, Electoral Registers, 1832-1955. Register of Electors, 1927, Parliamentary Borough of Birmingham, Edgbaston Division. Market Hall Ward, page 2. Copy viewed at Ancestry – Midlands, England, Electoral Registers, 1832-1955. Supplement to the British Medical Journal, 15 Nov 1930. Register of Bio-Physical Assistants. Page 214. Copy viewed at Europe PMC. Supplement to the British Medical Journal, 9 May 1931. The Register of Bio-Physical Assistants. Page 1. Copy viewed at Europe PMC. Supplement to the British Medical Journal, 14 May 1932. The Register of Bio-Physical Assistants of the Society of Apothecaries of London. Page 3. Copy viewed at Europe PMC. Supplement to the British Medical Journal, 13 May 1933. The Register of Bio-Physical Assistants of the Society of Apothecaries of London. Page 2. Copy viewed at Europe PMC. Bath Chronicle and Weekly Gazette, 9 May 1942, page 7. Bath Raid Fund Now Over £10,000. Register of Electors, 1945, Parliamentary Borough of Birmingham, Erdington Division. Gravelly Hill Ward, page 7. Copy viewed at Ancestry – Midlands, England, Electoral Registers, 1832-1955. Death of Charlotte E Atcherley registered at Meriden, June quarter 1946; volume 6d, page 620; age given as 93. Death of Ethel Mary Atcherley registered at Sutton Coldfield, January 1971; volume 9c, page 3023; d.o.b. given as 12 Feb 1884. National Probate Calendar (1971). Copy viewed at Find a will.